Pettisville Schools will have several summer jobs available for students. Anyone who is interested should pick up an application in the office, complete it, and turn it in to Dr. Switzer. All junior high and high schoolers that have been or are a student or office aide this year, please plan on another group picture on Tuesday, March 13 at 11:35 in the atrium. Please dress accordingly. Activity Period today will be for FFA and Student Council. FFA will meet in Mr. Poulson’s room and student council will meet in the theatre. All other student please report to homeroom. These students have been selected to participate in the 2018 BGSU Middle School Honors Chorus. They will perform at BGSU on Saturday, May 5th. Representing Pettisville are Madison Beck, Keilah Fish, and Lyla Heising. Congratulations, singers! This is a reminder that prom RSVPs must be turned in by Wednesday, March 14. The RSVP was sent to all juniors and seniors through your email. After you have filled this form out, return the tear-off from your ticket and any money to Lindsey Crossgrove or place in Mrs. Miller’s mailbox. There is a $20 deposit fee PER PERSON and all underclassmen or non-Pettisville dates must pay $20 for a dinner. Please turn these in as soon as possible. 7th & 8th graders: The prize day for cumulative prizes for the fundraiser will be Monday during 8th period. There will be a Spanish Club trip meeting at lunch today in Sra. Richer’s room. Yesterday, the junior high quiz team traveled to Archbold for the Fulton County Tournament. The 7th grade team defeated Swanton but then lost to Evergreen and Wauseon in a nailbiter. They were the 3rd place team overall. Sam Myers was team high scorer with 22 points followed by Ella Hudspeath with 10. The 8th grade team defeated Wauseon but then lost to Archbold and Wauseon in another close match. They were the 4th place team overall. Lyla Heising was team high scorer with 20 points followed by Pete Rupp with 9. Congratulations to the Nerd Herd Jr. on all their hard work this season. Detention today will be in Ms. Dorosz’s room. Students have just over a week to complete an application to attend the STEM overnight field trip to Stone Lab on Lake Erie. The field trip will include taking a ferry over the Kelly’s Island and then a smaller boat out to Gibraltar Island where Stone Lab is. We will spend part of our time collecting samples from Lake Erie on a small research boat and taking them back to the lab to analyze, seining along shore for macroinvertebrates, and learning the geologic history how Lake Erie formed. We will stay overnight on the island in their onsite facilities. Normal cost for the trip is $150 per student, but due to generous donations through the Center for Great Lakes Literacy, Pettisville Foundation, and Pettisville FFA Alumni and Friends, the cost per student is only $30. Don’t miss out on this awesome opportunity. See Mrs. Meller or Mrs. Miller if you have questions. Attention all incoming freshmen and high school students: There will be a summer soccer sign up registration table today during lunch. If you are interested in playing soccer this summer, please see Coach Switzer today during lunch. Student Council members should come to the band room at lunch today to stuff Easter eggs. 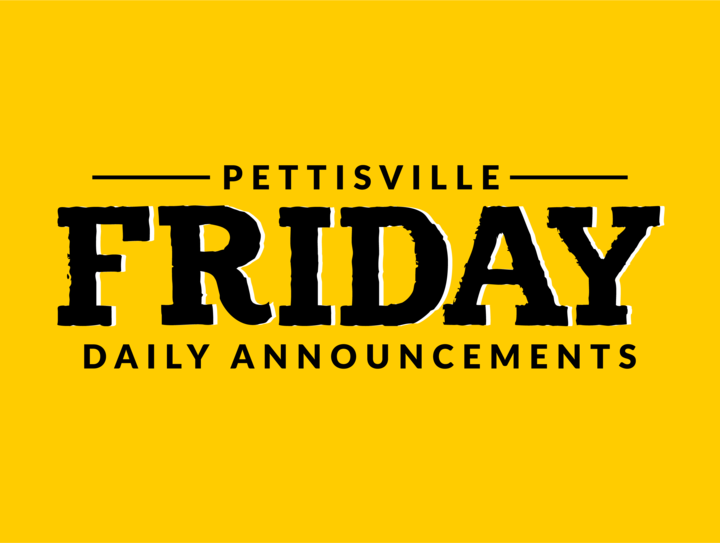 Over the weekend, the high school quiz team hosted the first ever Pettisville Invitational, dubbed “Petti Wars.” The Pville Team A finished in 4th place overall but was the top placing small school in the tournament. Jake Myers was named All Tournament First Team. The Pville team B came in 1st place in the consolation bracket, and Levi Myers was named high scorer for the B team. Congrats to all participants and good luck to the JH quiz team at the Fulton County tournament this Wednesday. 12 students participated in the NW Ohio Regional Science and Engineering Fair at NSCC this past Saturday. Those students representing our school were: Jordan Skates, Jessie McWatters, Kayla Wyse, Matt Rupp, Josh Bock, Madeline Shumaker, Pete Rupp, Baden Skates, Dylan Rash, Clara Damman, Karsyn Hostetler and Angie Rosillo. Students receiving Sponsored Awards were: Josh Bock, Karsyn Hostetler, Clara Damman, Dylan Rash, Baden Skates, Madeline Shumaker, Jessie McWatters, Jordan Skates, Kayla Wyse and Matt Rupp. High School students selected to participate in HS Super Judging: Matt Rupp, Jessie McWatters, Kayla Wyse, and Jordan Skates. The students who will be attending the International Science & Engineering Fair (ISEF) in Pittsburgh, PA in May are Jordan Skates, Kayla Wyse and Jessie McWatters. Congratulations to all! This is a reminder that track practice for junior high and high school begins tonight after school. The track teams will meet in the varsity gym today after school. The junior high will practice until 5:00pm and the high school will practice until 5:30pm. Student Council members should come to the band room at lunch tomorrow to stuff Easter eggs. Detention today will be in Mrs. Dadisman’s room.